Every morning, I go for a walk on my terrace. The stretch of open space has proven to be the most hassle-free exercising venue for an undisciplined soul like me. I don’t need to sport special attires since technically it’s part of my house. I usually climb my way up when the morning manifests itself fully. This means I don’t start my day with the first rays of the sun, but only when the soft rays mature into a generous splash of tropical sunshine spread across at least a section of the terrace land. My mornings on the terrace have introduced me to a whole bunch of friends and events. 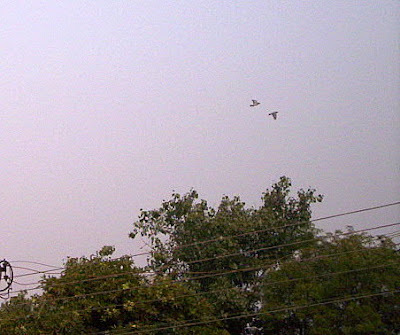 The All-India Avian Congress is hard to ignore, what with the volume of its esteemed members’ throats. Crows clearly appear to dominate the proceedings, even as pigeons prefer playing the part of silent board members. They leisurely take up their positions atop building roofs or electric poles, barely putting up with their cacophonic counterparts. At times the meetings don’t end on a peaceful note, leading to a show of strength with regard to territorial rights. Again, the agile crows take the lead, often scaring me with their ominously low flights, marked by agitated wind flapping. Are these birds known to have higher blood pressures? I suspect so; especially since a couple of them attacked me during a park walk around a year ago. The crowing supremacy cowers into a resigned defeat, however, when kites appear on the horizon. Where the crows and pigeons vie for slices of the sky, the kite claims the entire pie with a single sweep of its magnificent flight. My walk stops momentarily as I look up, transfixed to see this breathtaking stretched-wings wonder spanning across the blue canvas. Soon the chirpy parakeets rush in, restless to get on with business as soon as possible. 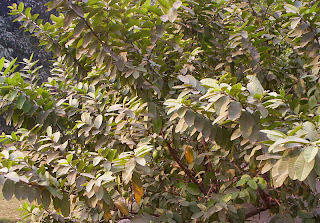 The business being picking on the fresh guavas off our tree in the backyard. They do get some competition from the home mynas, who are already found soaking in the comfort of a cozy nest amid the foliage of the guava tree. Although the parakeets are almost always too swift for my reflexes with the camera, they make me smile. Not just for their alacrity, but also because folklore tells me guavas bitten off by a parakeet turn out to be the sweetest of the lot. 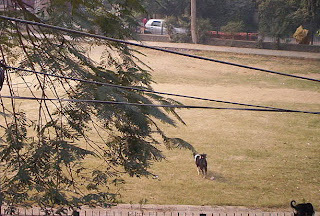 Then there are the canine friends who are the kings and queens of the park behind our house. Seeing them send out vociferous warning messages to any outsider dog is being witness to the act of maintaining the security of one’s sovereign regime. My walks have also unraveled to me an ancient scientific understanding. Just as the sunlight ambles over to the spot where the homemade pickle jars are kept, I can tell it’s 11 am (did I not tell you I walk really late in the morning?). Amazing to know how accurate the earliest experts in astrophysics had been. 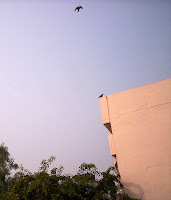 This morning, as I was ready to climb down the stair, the flight of two pigeons caught my glance. I couldn’t help stopping for a moment and be in awe. On more than one occasion I’ve suddenly noticed my footsteps gathering momentum automatically the second a catchy song is played on the phone radio I carry during my terrace jaunts. As the pigeons flew overhead this morning, I found their flight to be effortlessly synchronized to the song that was playing. Wonderful post. As someone who thought only pigeons flew by my house but recently discovered all sorts of great varieties (parakeets, blackbirds, bluebirds, robins, etc) I can relate to the wonder they bring. We have finches, who gossip, robins who practice, blue jays that jeer, mourning doves that sigh….It would be a sad world without our birds. This is a great post. A lot of times I get off work as the sun is rising, and the birds are deafening. 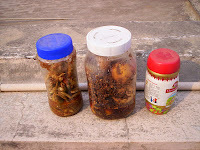 I don’t have jars of creepy things hanging on the sidewalk, though. Just my neighbor sitting half naked on his porch smoking. Cesar, so glad to hear about the birds in your neighbourhood. It’s such a joy to see them, isn’t it?Bernita, I love the way you describe the birds’ actions. ‘Always learn something new from you. 🙂Susan, so good to see you here. I was a tad worried about you. Glad you liked the post. Do keep visiting. 🙂Matt, can trust you to come up with funny observations like that. LOLThanks for the kind words. SHame on me, but i don’t even recognise the french birds that twirl around me. My mind is still set on NZ and UK birds, but there’d be some of the same, right? How delightful!Wishing you and yours a wonderful holiday season and a glorious new year! Keep stopping and smelling those roses!